BREAKING NEWS: Craig Anderson got a raise recently. Patrick Wristwatch will play his second game as an Ottawa Senator. According to everything I read, no one who watched the last game was happy with his play sooooo best of luck young man! His parents will be in the audience AS WILL ROMAN WICK’S! – don’t worry only a couple more of these to read before the end of the season! Oh, oh, hold on im getting a text on my Newton, it says “Or u could just quit now bro, lol, g2g ttyl” Please someone help me figure out what a lot of that means in the comment section, Im turning 65 this month I cant be bothered to figure out new acronyms, thx. The Senators can be mathematically eliminated from their TIGHT playoff race with the powerhouse Islanders with a loss tonight. Is that when it is fun to cheer for a win again? Speaking of playoff spots, the New York City Rangers look to improve their playoff standing and, lets face it Sens fans, have a preeeeetty good chance considering how star defenseman Wade Redden tends to light it up against his old clu- oh hold on… just doing some very believable research on the Official Rangers’ Friendster page…hmmmph…Wade Redden doesn’t appear to be listed in tonights starting lineup…I hope its just a typo. I was really looking forward to another chapter in that epic Redden-Cheechoo rivalry. Oh well, Lionel Messi (who wears his Coca Cola/ Claro(? )/ Adidas presents: Agentina jersey AND jacket in public apparently) gets the start in net for New York. Oh scratch that folks, it will be Henrik Lundqvist who according to askjeeves is, reportedly, dashing. Prediction thing: Lundqvist remains dashing, Wiercioch on the ice for a goal *tugs collar*, Karlsson finishes game with more points than Wade Redden. Just kidding Redden’s new team The Ypsilanti Aristocrats don’t play until Saturday. This entry was posted in Shame Day Preview and tagged Being Dashing, Cocacola/Claro(? 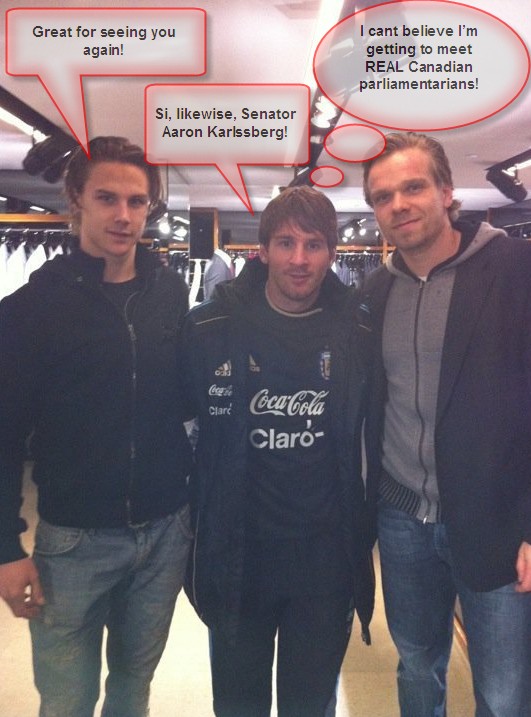 )/Adidas Presents Series, Lionel Messi, Senator Aaron Karlssberg, Ypsilanti Aristocrats by worsteverything. Bookmark the permalink. Roman Wick is EDWARD SCISSORHANDS. New York City Rangers is one classy name for a hockey club. The ‘City’ really puts it over the top. Tres 1890s chic.